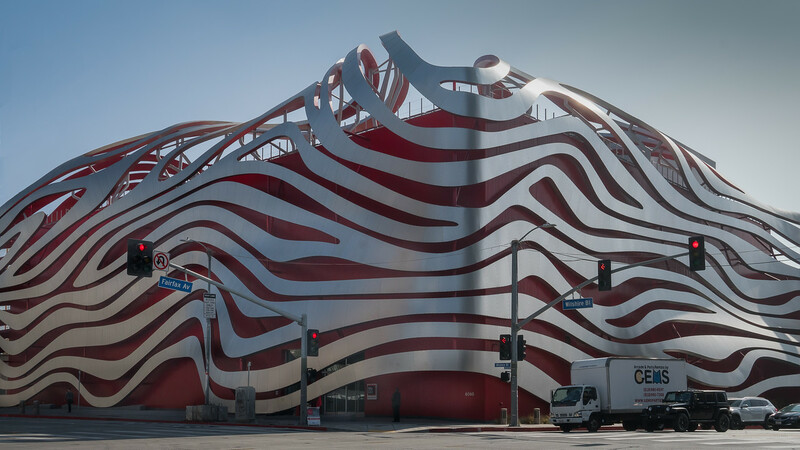 What a thrill to finally visit the Petersen Automotive Museum! I’ve considered this trip for years but holding off was a good idea. The museum, originally an unused department store, underwent renovation in 2015. The new version is a showstopper! I grabbed this shot, risking the busy traffic on Wilshire and Fairfax, just around noon. If I waited any longer, traffic was certain to get worse. The building’s façade was redesigned by the architectural firm Kohn Pedersen Fox, and features a stainless-steel ribbon assembly made of 100 tons of 14-gauge type 304 steel in 308 sections, 25 supports and 140,000 custom stainless-steel screws.. Designers at The Scenic Route configured interior spaces to accommodate changing exhibits that encourage repeated visits. The remodeled museum opened to the public on December 7, 2015. This is a luxurious museum, which like its cars, sparkles and shines. The staff is precise and helpful. The program suggested I start on the third floor, the History area. Here one finds examples of the very first automotive vehicles. They look like modified bicycles. 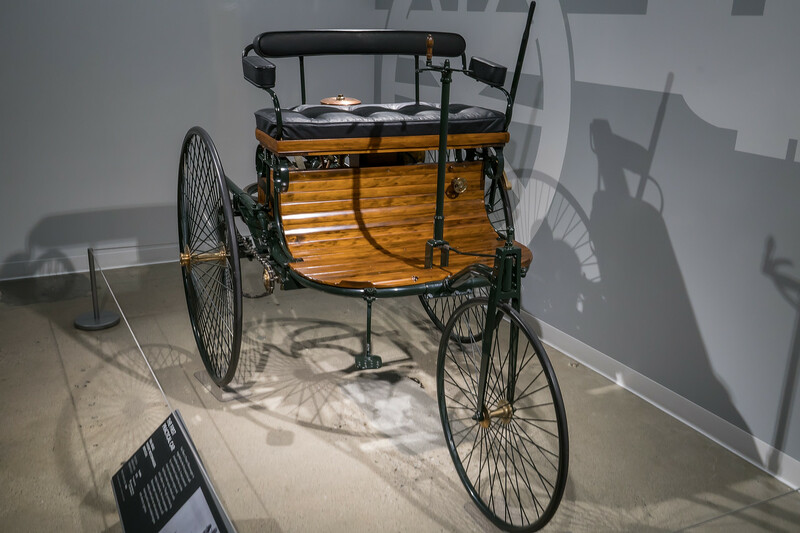 Powered by a four-stroke engine, this innovation had a top speed of 10 mph. Frankly, it looks like a precarious ride and I doubt I would want to go top speed. There were some fabulous cars on the third floor. This Duesenberg is a stunning sight. It was part of the Cars from Film and Television. 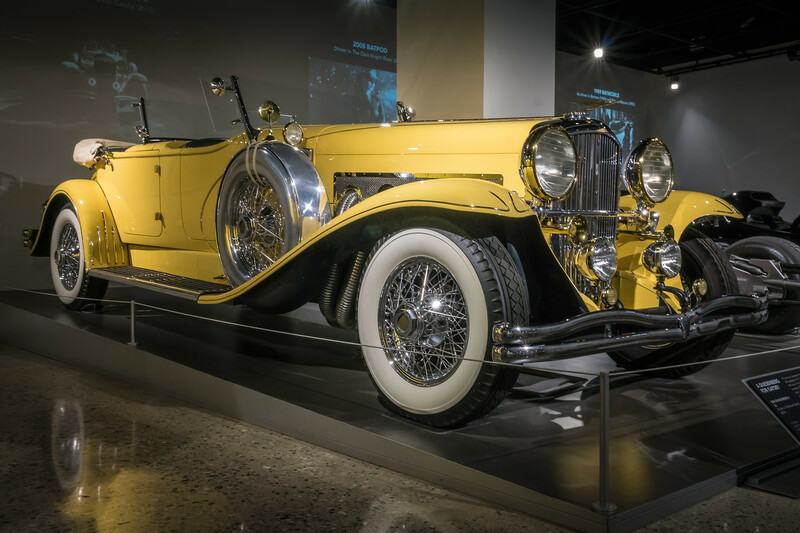 1984 Duesenberg II SJ, driven in the 2013 film, The Great Gatsby. The image doesn’t to it justice. It is magnificent. And big! Boy did it shine. There is chrome everywhere. Notice the trim on the fenders and around the doors. One of the highlights was the first floor, titled Artistry. I spent most of my time here viewing the special exhibit, The Porsche Effect, which is on display to celebrate the 70th anniversary of Porsche. Doesn’t this little blue model look like it would be fun to drive? 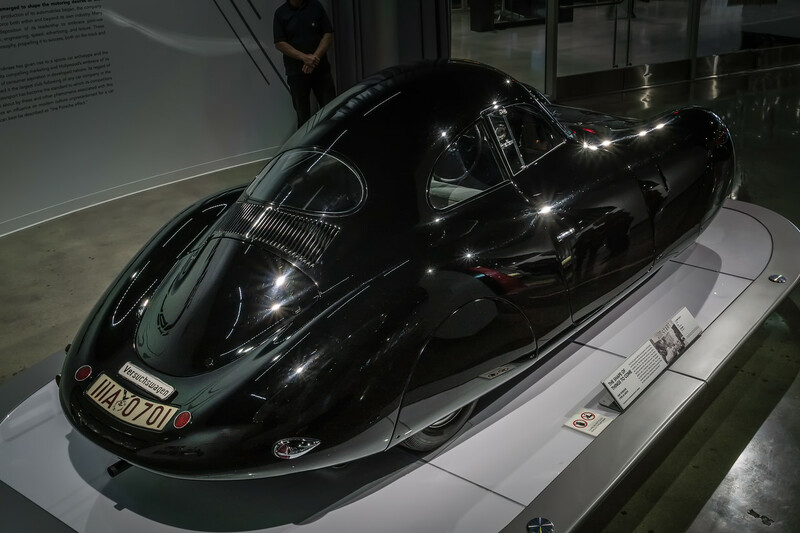 One of the earliest cars in this exhibit was a 1939 Type 64 Porsche, the car that started it all. This was designed and built to enter the 1939 Berlin-Rome Endurance Race. World War II intervened and the race never took place. I could ramble on about The Porsche Effect, but I’ll spare you. Instead, I’ll mention one other exhibit that I wanted to see, and ran out of time! 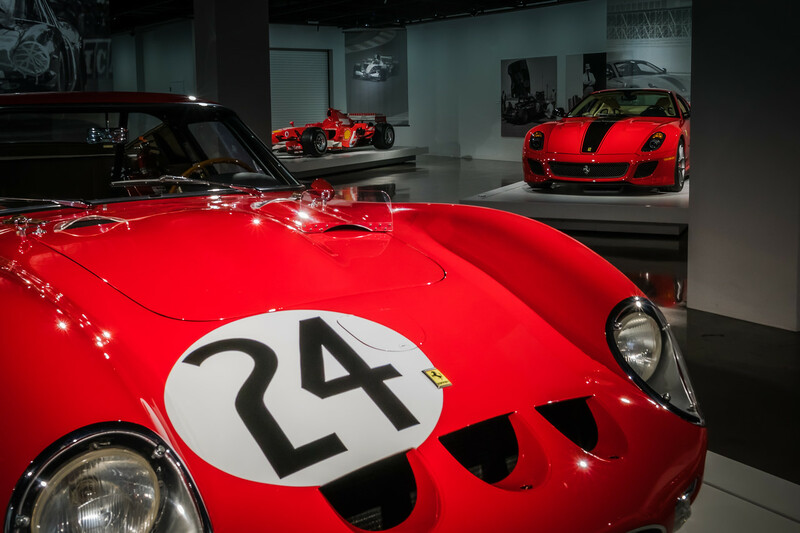 Seeing Red: 70 Years of Ferrari was a must-see for me. I risked spending hours on the freeway in order to spend a few minutes looking at this exhibit. As anyone can tell you, I’m fond of red cars. How could I possibly resist Ferrari? 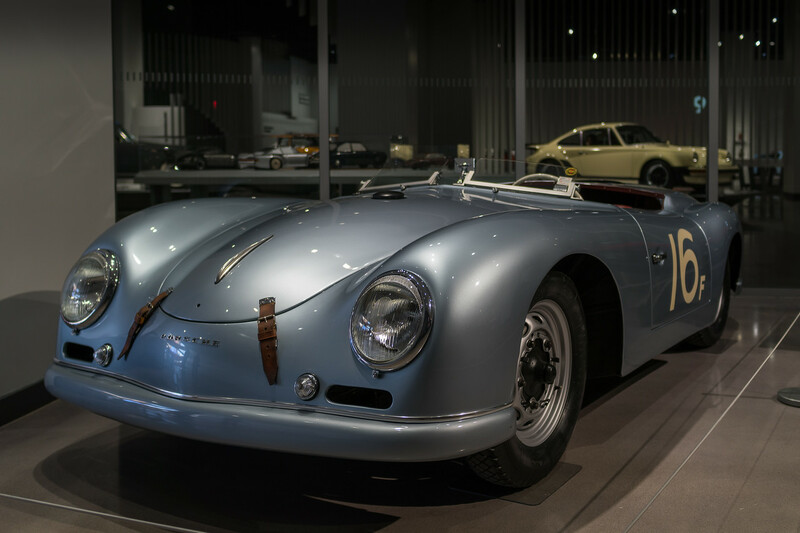 The Petersen is located in Los Angeles, in an area known as The Miracle Mile. It’s very near the La Brea Tar Pits and the Los Angeles County Museum of Art. One day there will be light rail service to this area, but that day isn’t today. The museum is open seven days a week, 10:00 am to 6:00 pm. Admission varies depending on the usual things-age or military service. There is an additional charge for guided tours. There is an onsite restaurant called Drago Ristorante, where I had lunch. I could have had pizza or pasta but they were kind and allowed me to order just a bowl of soup. I didn’t want to spend time eating when I could be looking at beautiful cars! The parking lot is covered and has an additional fee. Check the Petersen’s website for accessibility information. It’s rather tricky. There’s nothing for it; I shall visit again. I may see all three floors the next time. Perhaps a third visit will give me time to add the extra excursion titled The Vault. This is where the cars are kept when they aren’t on display. Who knows what may be there! 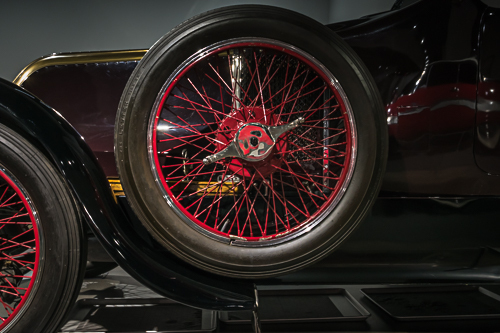 To see more of my images from the Petersen Automotive Museum, please click here.